Recipes Did the Flintstones have it right with large-portion meat? Did the Flintstones have it right with large-portion meat? 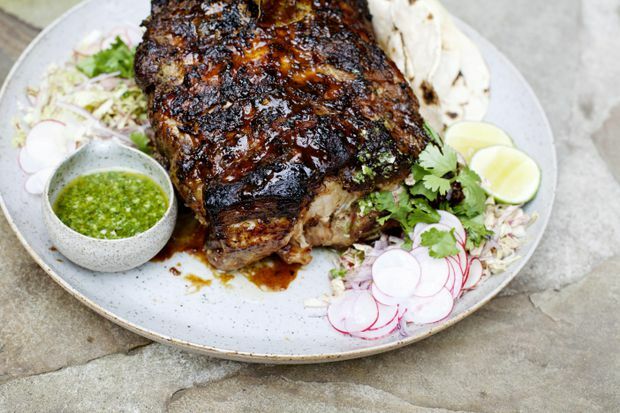 Citrus and herb pork shoulder. Vegetable-forward and plant-based dishes are undeniably a new norm in contemporary cooking, both at home and in restaurants. That said, every action has an equal and opposite response, and confidently meat-centric mains are returning to menus with old-school appeal. These feasts inspire convivial, family-style eating, and in some ways, the over-the-top plentitude provides an unexpected comfort. Of course, large-format servings are a standard. And then there are dishes such as David Chang’s iconic Bo Ssam at Momofuku, which stars 10 pounds of pork. But even Chang’s collection has grown, now including steamed and fried Korean-inspired chicken, a whole brined-smoked-roasted seven-spice brisket and a rotisserie chicken with the legs fried and finished with a ginger glaze and the breasts stuffed with herb butter (all of these require 24-hour advance notice). In Los Angeles last year, Adam Perry Lang, deemed “the man who mastered cooking over fire” by the Barbecue Hall of Fame, opened APL, his temple to Flinstonian cuts. The accolades followed quickly, with breathy, tantalizing descriptions of handsome slabs of protein on offer. Lang upped the ante this holiday season with APL’s Beef Club: US$1,800 for an astounding 45- to 50-pound rib roast (tomahawk chop). Lang personally selects each roast for aging, then monitors its progress in the 1,000-square-foot bespoke room below the restaurant. The roast can either be enjoyed over time, experiencing the maturation as it develops, or as a single, all-out event with a crowd around the table. At home, preparing a large-format joint of meat or bird is usually relegated to holidays. However, with the start of the new year and its associated resolutions, as many set off on a goal of meal planning or advanced prep, I urge the consideration of a larger cut of meat as a component to a strategy of leftovers. This pork roast, and most of its ilk, requires the investment of time rather than hands-on effort. If the oven is already heated, it’s as easy to prepare two chickens as it is one. A roast of any sort takes the same amount of attention, no matter the size. And, as an additional boon, those larger cuts are often more cost-effective than portions. Roast it on Sunday and feast for the days following, or stash individual meals in the deep freeze for later. That extra chicken can be used in pot pie or stew. Brisket braised to succulence is my dream for next-day hash, or layered with sautéed onions, wilted greens and gossamer-thin potatoes in a creamy gratin. Cook a lamb leg with confidence, a side of salmon or a whole turkey breast – maybe even two – knowing your future self will be thankful. My route with the pork roast here is meant to lead to enchiladas in the future, or maybe a tamale pie, and most definitely a medianoche (a pressed Cuban sandwich with cheese and pickles). It begins with a dazzling marinade inspired by Mexico and Cuba, one full of floral-sharp citrus, blistered chilies and robust herbs. Speaking of the herbs, the recipe mentions cilantro and Mexican oregano, but those seeking an extra zing might want to sneak in fresh mint as well. I refer to this as my low-ish and slow-ish pork roast, because four-ish total hours of cooking is hardly quick, it is comparatively modest to the patience-wearing six to eight hours it would require at the most gentle heat. Those who have such commitment, I salute. Even with that slight compromise of hastening the process, the shoulder emerges from the oven fragrant and melting. Taking cue from Adam Perry Lang’s expertise, I crib his technique of a “board dressing” to finish the roast – here, a gutsy second dousing of the flavours with which we began. It’s a last-minute flourish that makes all the difference. One day’s cooking and the week is set. Preferably the day before you want to eat, preheat a seasoned cast-iron skillet over medium-high heat. Without oil, blacken the onion wedges and jalapenos on all sides. Alternatively, blister all on an open gas flame, using tongs to turn. Set aside to cool. Pop the onions, strips of citrus zest and bay leaves into a zip-top bag large enough to accommodate the pork. Pour the juices and olive oil into the carafe of a blender. Drop in the cilantro stems, peeled garlic cloves, oregano, cumin, kosher salt and freshly ground black pepper. Stem and seed the blistered jalapenos, and add to the carafe. Blend until smooth. Taste, and adjust as needed – keeping in mind that the pork can handle an enthusiastic seasoning. The marinade should taste brightly acidic but not harsh; add more olive oil to round it out if needed, or more citrus if not sharp enough. When satisfied, tuck the pork shoulder into the bag, and pour the marinade over. Seal and massage the liquid into the shoulder, making sure it’s coated well on all sides. Place in a baking dish or similar and refrigerate for six hours or preferably overnight, turning periodically. To prepare the shoulder, preheat an oven to 325 F with a rack in the lower third. Line a quarter sheet pan or large shallow roasting tin with a double layer of foil. Place the shoulder into the centre of the foil, fat side up, then decant the marinade and onions on top. Pluck out the zest strips and discard. Loosely bring the edges of the foil up around the pork. Place in the preheated oven and cook for three hours. Pull back the foil, increase the temperature to 425 F and roast for around 90 minutes more, or until the internal temperature reaches 185 F at the centre and the exterior is well browned and cracked. If the roast is browning too quickly, recover with foil. Remove the shoulder to a board and rest for 30 minutes. As the shoulder sits, make the dressing. On a board, pile the cilantro, oregano, jalapeno and garlic. Run your knife through all until finely minced. Scrape the resulting confetti into a medium bowl. Stir in the citrus juices and olive oil. Season to taste with kosher salt and freshly ground black pepper. If enjoying the shoulder as tacos, untie and either slice against the grain as needed or shred with two forks. Anoint the sliced or shredded meat with some of the dressing. (As pictured, baste with dressing, present the roast in its entirety, and carve at table.) Serve with lots of sliced radish, pickled onions, shredded cabbage, salsa roja and lime wedges. Offer warm tortillas alongside. Leftover shoulder can be stored whole, bathed in some of the dressing, which will keep it the most lush (store the remaining separately). Or, portion and freeze the shoulder in smaller portions, each with a pour of dressing as lubricant.